Those who recovered from a previous exposure to the plague could safely care for patients who were ill without contracting the disease a second time. So observed the Greek historian Thucydides during the plague of Athens in 430 BCE. This same principle applied to Edward Jenner’s 1796 observation that milkmaids who had contracted cowpox did not get smallpox. A century later, the mechanism was uncovered: In 1890, Hans Buchner discovered a “protective substance” in blood serum capable of destroying bacteria, and in 1897, Paul Ehrlich identified these as antibodies responsible for conferring immunity. Invertebrates and vertebrates initiate an immediate defensive mechanism when confronted by a pathogenic microbe or foreign tissue. This primitive, nonspecific response is called innate immunity. Vertebrates have an additional and far more powerful layer of immunological protection, called adaptive or acquired immunity, which develops over weeks. Adaptive immunity is characterized by molecular specificity directed against that pathogen and an immunological memory that specifically targets that pathogen even when reexposure occurs at a distant future time, when the immunologic response is rapid and enhanced. Two types of adaptive immunity occur, both arising from lymphocytes (a type of white blood cell): Humoral immunity or B-cell immunity results in antibody formation in the blood that attacks the microbe or foreign cell. The second, cell-mediated immunity or T-cell immunity, causes the formation of a large number of activated lymphocytes specifically also intended to kill the foreign cell. An antigen, any protein substance that stimulates a response from either B- or T-cells, binds to a specific antigen receptor on either cell type. The binding of an antigen to a B-cell antigen receptor leads to the formation of an antibody or immunoglobulin that eliminates the pathogens in the blood, while activated T-cells promote the production of antibodies or kill infected cells. Adaptive immunity can also be conferred artificially via vaccinations, such as those against polio, measles, and hepatitis. Tissue and organ transplants, containing foreign cells, may initiate an immune response that can result in their rejection. SEE ALSO: Innate Immunity (1882), Acquired Immunological Tolerance and Organ Transplantation (1953). 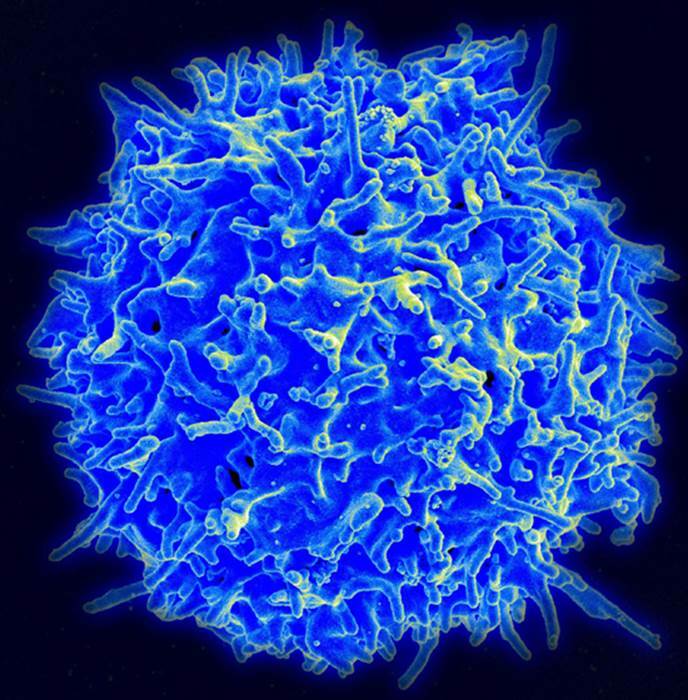 A scanning electron micrograph of a human T-cell. After recognizing molecules on the surface of a virus, the host’s T-cells are activated to mobilize an attack on the foreign invaders, ideally resulting in their destruction.